Let’s talk about stoppages today and what most people, including plumbers, think are common reasons that a sewer line will back up. Stoppages are all too common, we clear hundreds of stoppages a week, in fact, it is one of the most common reasons a homeowner or businesses owner call a plumber. We never think about our plumbing, until it doesn’t work. When our drain lines are backed up, for most of us, it is considered an emergency and the plumber can’t get there fast enough. Trust me; we wish we had ambulances instead of giant lime green plumbing vans when a client has a main line stoppage. A stoppage can create a risk to your health as well as risk of damage to your property. We take drain stoppages very seriously as a part of what we do as professionals in the plumbing industry. If you’ve ever had a stoppage in your home or place of work, you know it creates havoc and is about as frustrating as being without an air conditioner in the heat of summer or broken down on the side of the road waiting for a tow truck when it is 115 degrees outside. A main line sewer stoppage will prevent the ability to do common everyday things that we take for granted like washing our hands, using the restroom, taking a shower or doing our dishes. When your main line is backed up nothing that requires water can be used in your home. You may have noticed the last time your main line was backed up that everything came up in the tub or shower of your home. Yep, that’s right, for many homeowners when the main line is backed up everything, including flushing the toilet will send sewer water to the lowest point, the tub or shower. Try not to think about that the next time you’re in the shower. The inconvenience and cost increase when you consider that you will likely have to take time off of work to have the problem resolved. Knowing how inconvenient stoppages can be and the property damage they can cause who would ever want to have a stoppage again after experiencing one? Certainly not you or me. That is where our quest begins, never having a main line stoppage again. Recently at one of our weekly trainings I asked all of our team members to share what they felt were causes of sewer stoppages. I wrote everything they said on our white board and the list of things that, in their extensive experience, backed up sewer lines filled up the board. Here is some of the list that a combined over 100 years’ experience came up with. This list is just a few of the things that our team said as common causes of stoppages and things that they pull back when they run a cable down a drain line. Of course, the list was a lot longer, and we had some fun stories to share, like remember that time that…..never mind you don’t want to know. Confident that they had a solid list of causes of stoppages I challenged their perspective, and I am challenging yours as well. What on the list is truly the cause of a stoppage? Your main sewer line is usually 3-4” diameter pipe and should have the perfect slope or grade to allow water to run fast enough to carry things with it but slow enough that the water doesn’t move faster than the debris it is supposed to carry. With that in mind looking at the list again I asked our team “What is really the cause of stoppages in a sewer line?” If the line is in good condition shouldn’t a face wipe easily go down, shouldn’t egg shells easily go out to the city? If the line is functioning properly shouldn’t feminine products, especially that say flushable get right out to the main city sewer line without a problem? Looking at the list again we reduced down the real causes of sewer line stoppages. It is always our goal to permanently solve our client’s plumbing issues, as we have discussed having a stoppage is never a good time, they can be messy, expensive and can cause massive property damage. Once you’ve had a stoppage, you never want to have one again. If you were fortunate enough to have a stoppage with no property damage, you’re one of the lucky ones. Many clients when they experience a main line stoppage, sewage goes everywhere, and many have to evacuate their homes while the biohazardous material is cleaned up. In the quest to prevent having a reoccurring issue let’s discuss what is really causing stoppages. It is the condition of your sewer line as I will explain quickly here. Grease stoppages will continue to be a problem until the grease is removed. I’ve covered grease stoppages before, and they are worth covering again. Grease lining the side of your pipe won’t go away simply by running a cable down the line. The cable will only clear what is stuck in the grease, not the grease itself. Grease lines the interior of your sewer system and builds up layer after layer and over time will reduce the inside diameter of your sewer line making it hard for even the smallest things to pass through. Grease also creates pockets for things to get stuck in as well as a very bumpy ride. If your line has grease in it, and it likely does, you should consider jetting your sewer line. Before jetting your line, you will want to have a camera inspection of your sewer line performed to make sure that your sewer line is in good enough condition to have a jetter run through it. A camera inspection will offer a visual inspection of the interior of the line and allow the plumber to inspect, as well as he can, the sewer line to confirm that it is sturdy enough and in good enough condition to have high-pressure water run against it. There are some drain lines that are too old and brittle to be jetted and those lines should be replaced rather than maintained. Roots in your sewer line are a cause for a stoppage, and if not taken care of and repaired, the cause of many more stoppages to come. 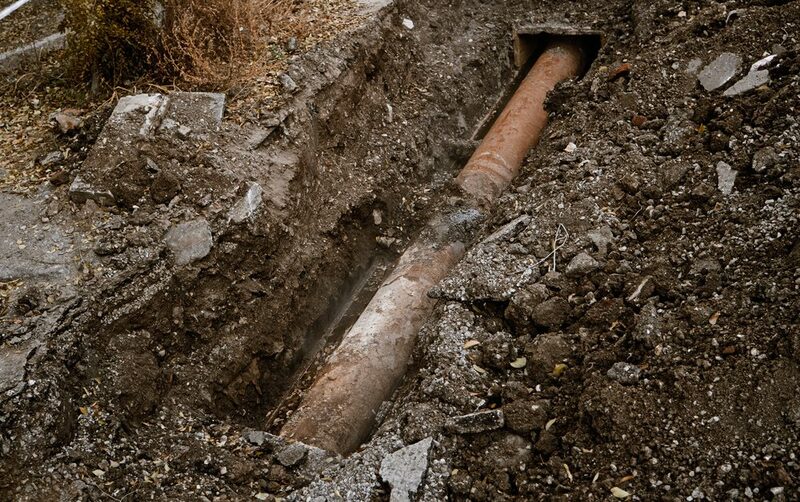 A sewer line with roots in it is compromised and broken, and the only option is repair or replacement, or you will experience multiple stoppages until eventually the line will be completely closed off and crushed and can no longer be cleared with a cable. Roots grow aggressively in sewer lines, and even if you pull the tree, bush or plant that has broken into the sewer line the line is still broken, and the roots will continue to grow, and eventually, the sewer line will collapse. Belly in the sewer line is likely something you haven’t heard before, who cares if your sewer line has a belly, well, you should. Sewer lines are designed to be at a specific grade depending on the size of the sewer line and the length of the sewer line. Debris needs to be able to flow downhill at perfect grade to drain properly. Let’s picture it this way, have you ever ridden a bike on a nice downward grade? It is easy, and the bike practically drives itself, you just have to hold on and steer. Now picture riding that same bike uphill, even with the wind at your back it takes a lot of effort to get uphill. The debris in your sewer line doesn’t have the benefit of your effort to get uphill, so it doesn’t. It just sits there and builds up and backs up. The only solution to remedy this is to get the sewer line back into the good downward slope. Otherwise, you can expect stoppages again and again. The collapse of the sewer line is exactly what it sounds like. It is a section of sewer line that has been compromised and is no longer round; it is broken and collapsed. Similar to those action movies we’ve all seen where the bridge collapses and everyone is trapped on one side or the other – that is a collapsed sewer line. Though it wasn’t done by a fly by jet, a terrorist bomb or a giant robot. 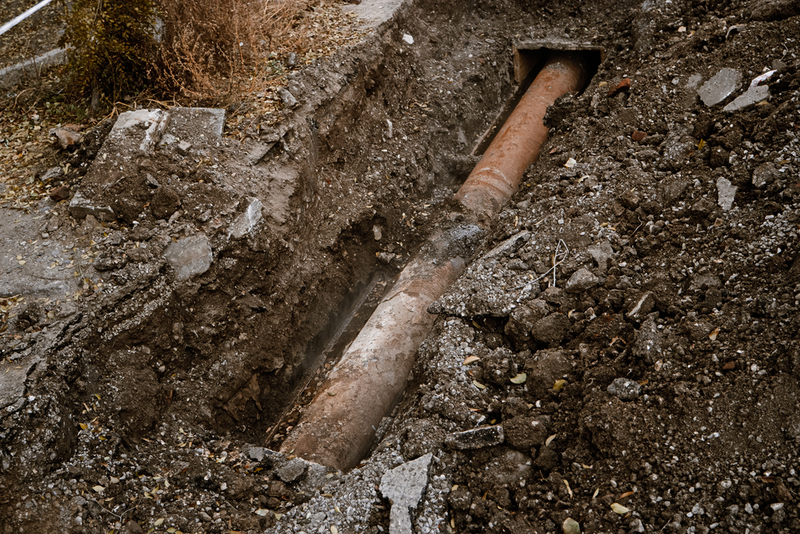 Sewer line collapses happen for a multitude of reasons a few are that the pipe that was installed was of inferior quality or even that the pipe was crushed by landscaping. Rocks in your sewer line will easily create stoppages. The rocks are usually put in the line through the cleanouts. We see this at many apartment complexes and condominium complexes. Sometimes the rocks are put there as sabotage, but more often it is kids playing. They find the cleanouts sitting there and remove the cleanout caps and start putting the nearby landscaping rocks down the line. If the rocks aren’t quickly discovered at the cleanout and removed they will slowly spread further down the line creating a damn that water and debris cannot get past. If your sewer line is in good condition only misuse and sabotage will create a stoppage, like the rocks, toys or other large debris not meant to go down the sewer line. If your line wasn’t backed up due to misuse or sabotage the only other explanation is that the line is compromised and should be inspected and possibly cleaned or repaired. Stoppages are a sign of an underlying problem, they are a symptom and while clearing the stoppage may temporarily alleviate the symptom it will not permanently solve the problem. You can continue to pay someone to clear the stoppages and alleviate the emergency, but ultimately that will cost you more money in the long run. Continuing to pay to clear stoppages when the line inevitably will have to be cleaned or repaired is quite literally throwing money down the drain. We want to make it as affordable as possible for clients like you to fix their problem permanently, that is why we offer incredibly competitive pricing, financing options, and reduced camera inspections during the visit that we are clearing the stoppage. Don’t let stoppages ruin your day if you’ve had a stoppage more than once it is time to call us. If you’ve already had another company quote you for repairs, it is time to call us. We would love to offer you a second opinion and quote to solve your plumbing issue. We are often more affordable than our licensed competitors simply because the majority of our advertising comes from referrals from clients just like you, not big expensive marketing campaigns and celebrity endorsements. Call our office today; we’re here to help.